Diz is a reckless teenage drifter living life on the run. Abandoned by his parents as a child, he looks out for himself and doesn’t accept handouts. He takes whatever he wants and runs. Jaded and determined to answer to no one, Diz lives a life marked by thievery and abandonment. Things change for Diz when he floa ts into a small town on the Snake River. There he is confronted by an unflappable old man named Marty and falls for Marty’s guarded granddaughter, Selah. When Diz robs a local drug-dealing crazy, he becomes the owner of a giant pile of cash and the target of two vicious killers. 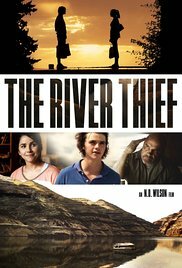 “The river thief” managed to leave me speechless. And this merely by the denouement. The run-up was anything but interesting. It shows the life of Diz (Joel Courtney) as he leads it now. A carefree existence in which he steals anything he deems necessary, without feeling bad about it. He has no sense of values. Diz is a street boy whose mother abandoned him and left him behind in an alley . And now he’s looking for his natural father as he follows the banks of the Snake River. How long he has been doing this, isn’t really made clear. And the motive to seek his father is also hazy. His vagabond existence is halted when he meets Selah (Raleigh Cain). She’s a waitress in a kind of burger joint where she gets to know the habits of Diz. Namely not paying for the consumed burgers. Selah’s grandfather Marty (Tommy Cash. Yep, brother of the famous Johnny Cash) tries to teach the boy some life lessons and instead of giving him a scolding, he invites Diz for a steak night. Clearly grandfather Marty is a true religious person. Before you know it, all sorts of religious philosophies are exposed. About gifts and that you shouldn’t take life for granted. And also about those priceless things in life such as your heartbeat and your senses. When Diz succeeds in stealing a considerable amount of drug money in a very simplistic way, this is the beginning of a naive attempt to grow a friendship between him and Selah. One thing struck me. How the egocentric Diz undergoes a metamorphosis in such a short time. From one moment to the next he changes from being an indifferent person into someone who appreciates values ​​such as forgiveness and repentance. Probably for the first time in his life he’s facing a sense of guilt. He tries to apologize by flooding Selah with expensive gifts, which in turn creates a twofold problem. On the one hand, Selah doesn’t want this and she makes this absolutely clear. Secondly, the criminals could easily trace Diz because of this outrageous behavior. As a result Marty and Selah are also placed in a vulnerable position. Despite the limited budget, “The river thief” is blessed (sorry) with some brilliant impressions of the winding Snake River and other static nature scenes. In short, when looking at the technical side, it all looks professional enough. In terms of acting, it wasn’t too bad. Joel Courtney acts natural and convinces as the casual and spry Diz. Raleigh Cain is as passionate in her acting as Selah is in person, but sometimes it felt rather drab. And Tommy Cash is the oracle of the film. Nothing more nothing less. These are certainly not top performances, but they are at least better than those of the two gangsters Saul (Paul Johansson) and Clyde (Bas Rutten). And I don’t blame the actors themselves, but rather the script. It portrays these two figures in a fairly implausible and dumb way. Unfortunately, the content of this film is similar to the way in which the Snake River runs. Slowly it proceeds without any significant, exciting or tense moment. I read some articles where they labeled this as a “Christian movie”. Well for me it didn’t feel like a Christian movie at all. Besides, each film can be interpreted in such a way that people say there’s some kind of religious message hiding in it. Marty being a moralist, who tries to learn Diz certain life values, doesn’t make this a Christian movie suddenly. But I can tell you without hesitation, the surprising denouement totally blew me away. Not because of its violent nature, but mainly because I didn’t see this one coming. So, allthough there are a few bombastic topics about gratitude, forgiveness and self-sacrifice, it all felt rather contrived and banal to me. And even if there would be a deeper meaning hiding somewhere in this film, I guess it completely eluded me. Most likely there’ll be some philosophizing about this movie in theological circles. Unfortunately my intelligence falls short when talking about spirituality. Thank God.